One benefit of being a member of the military community is the privilege to fly space-available (Space-A) on military aircraft. Under the right circumstances, flying Space-A is a great way to save hundreds – or even thousands – of dollars on airfare. Flying Space-A could be the (free) ticket to your next getaway! If a military operational flight has extra space, after all equipment and personnel required for the mission have been accommodated, the remaining seats may be used by Space-A passengers. The military mission is always the priority, and the Space-A passengers are essentially cargo. When flying Space-A, you could be on any number of different military aircraft, such as a C-5, C-17, or KC-10. The Patriot Express, used to transport families PCSing to and from overseas locations, also accepts Space-A passengers if there are extra seats after space-required passengers have been accommodated. Keep in mind that if you are PCSing on orders, you are not traveling Space-A, even if you are taking the Patriot Express. Space-A travelers are divided into six categories based on their duty status and reason for travel. Travelers in Category (“Cat”) 1 are highest priority, and those in Cat 6 are lowest. Travelers in high-priority categories have the best chance at getting seats. It is important to know your category, because some passengers have restrictions on where and when they can fly Space-A. The Air Mobility Command (AMC) site has more detail on the categories and other Space-A eligibility information. Cat 1: Emergency leave unfunded travel. Cat 2: Accompanied environmental and morale leave (EML). Cat 3: Ordinary leave, relatives, house hunting permissive TDY, Medal of Honor holders, and foreign military. Note: This category includes active duty service members on leave traveling with or without dependents. Dependents of service members deployed for more than 365 days are also in this category. Cat 4: Unaccompanied EML and dependents of service members deployed between 30 and 364 consecutive days. Cat 5: Permissive TDY (non-house hunting), students, unaccompanied dependents of service members stationed outside the continental U.S. (OCONUS), post-deployment/mobilization respite absence. Cat 6: Retirees and their dependents, reserve, ROTC. 2) If you are a spouse and your sponsor is deployed or stationed overseas, you may be able to fly Space-A unaccompanied. Depending on the circumstances, you will be in Cat 3, 4, or 5. You will need a travel memo from your sponsor’s command. The memo serves as your authorization to fly Space-A, and you must keep it with you throughout your travels. This post about unaccompanied dependent Space-A travel has sample memos and an explanation of where and when you can fly if you are traveling without your sponsor. 3) Sign up as early as possible at every base from which you may want to fly. Priority within a category is determined by signup date and time. The longer you’ve been on the list, the better. At most terminals, a signup is good for up to 60 days. Active duty cannot sign up for Space-A travel until they are on leave. That restriction does not allow for much advance signup, but don’t worry, everyone else in your category is in the same situation. More importantly, even if you sign up the same day as the flight, you still have priority over travelers in lower categories, no matter how long ago they signed up. For details on how to sign up, visit Spacea.net. 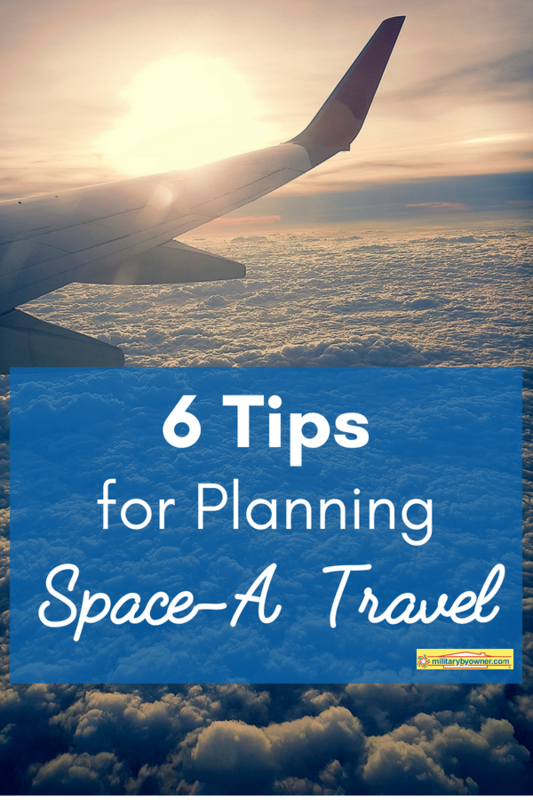 4) Don’t use Space-A if you really need to be somewhere or you have a short period of leave. The main challenge with Space-A travel is that it’s unpredictable. Most flight schedules are not available until 72 hours in advance, and you won’t know if you have a seat until the very last minute. If you’re traveling to an important event or you only have a week of leave, it’s best to fly commercial and save the Space-A travel for a time when you have more flexibility. 5) Facebook is an important tool to plan your Space-A travel. Even if you’re not an active Facebook user, there are two reasons why it’s worth having an account. The first reason is that most passenger terminals have a Facebook page where they post their 72-hour flight schedules along with the estimated number of Space-A seats. They also share historical data about Space-A seats on recent flights. Here is a detailed guide to the information you can find on passenger terminal Facebook pages. The second reason to use Facebook if you want to fly Space-A is to gain access to the Space-A Travelers Facebook group, which is a very useful forum to ask questions and learn about Space-A travel. 6) Be sure you have a backup plan or two. That plan might include flying to or from a less convenient air base or even changing your plans entirely to vacation wherever you can fly Space-A. Your last resort is to fly commercial. Be sure you have enough money to cover last-minute airfare! Use these steps to plan your Space-A flight, and you, too, can get free airfare on your next vacation! About the author: Stephanie Montague is the founder of Poppin’ Smoke, a website designed to encourage members of the military community to use their military benefits for (fun) travel. Stephanie and her husband have been traveling the world since he retired from the Army in 2015. Through Poppin’ Smoke, Stephanie shares everything she and her husband learn about Space-A travel and using military benefits while abroad. Stephanie shares news from military MWR facilities, updates from other military blogs, and links to great travel content on the Poppin’ Smoke Facebook Page.